The winners of Lee County School District’s (LCSD) inaugural Art Show were announced at the monthly Parent Advisory Council (PAC) meeting, Monday, March 25. 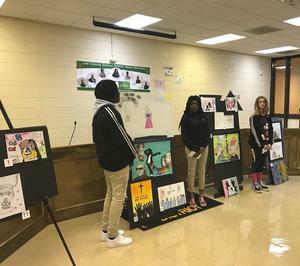 First place was awarded to Lee Central High School (LCHS) Junior Nidaisha Thomas; second place to LCHS Junior Donquez Hickman; and Lee Central Middle School (LCMS) Eighth Grader Gracie Blackwell garnered third place. 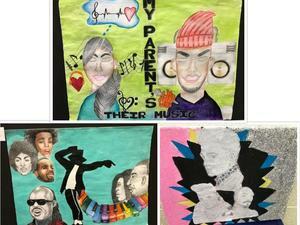 The theme of the Art Show was “My Parents: Their Music”. Students were asked to reflect on their parent’s choice of music and apply the theme to a visual presentation. The first place prize of $75 was given to Thomas for her depiction of her parents with a floating boom box, musical notes, microphone and heart in the backdrop. The second place prize of a $50 gift card was given to Hickman for his rendering of his parents with images of musical giants Marvin Gaye, Michael Jackson, Whitney Houston, Lenny Kravitz and Stevie Wonder. Blackwell took home a $25 gift card for her half painting and half sketch of three musical icons. There were a total of fifteen participants in this year’s event. Those not listed above are: LaKevia Austin and Ny’asia Green (5th grade) and Jada Williams (4th grade) of Dennis Elementary School; Brandon Drakeford and Shar’Nyah Jordan (4th grade) and Michael Smith (3rd grade) of West Lee Elementary School; Mandalyn Downing and Kesanie Edwards (6th grade) of LCMS; and Zy’aire Belle (11th grade), Aunise Robinson, Ty-Jir D. Outten and Othello Stadard-Reeves (10th grade) of LCHS. The PAC’s next meeting is scheduled for Monday, April 29 at 6 p.m. and will feature Poetry and the Spoken Word. For additional information, please contact LCSD Office at 803.484.5327.